Trees are the living foundation of the urban ecosystem; they provide habitat, shade, and protection against storms. 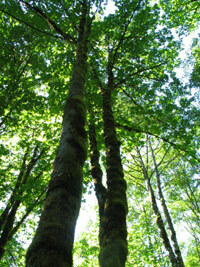 Trees also absorb pollution, help fight global warming, and increase property values. Brende and Lamb’s mission is to use science and art to help your trees be as healthy and as beautiful as possible. Within almost every tree, even those that have been abused and neglected, there exists a beautiful plant waiting to be revealed. Even if 30% of the foliage is removed, a well-pruned tree should look more ‘natural’ after it is pruned. Revealing the natural beauty of a tree requires skill, attention to detail and years of practice. For over 25 years Brende & Lamb has been developing a team of tree care professionals dedicated to the highest standards of aesthetic pruning. We have built our reputation on a skilled staff (many of whom have been with us for decades), a commitment to arboricultural education, and attention to exacting detail. We pride ourselves on our ability to balance the needs of privacy, view, aesthetics, safety, and tree health. We recognize the relationship between the quality of one’s environment and the quality of life. Our estimates are free, our staff helpful and friendly, and all of our work is guaranteed. We offer a variety of tree care services that include: enhancing tree health, aesthetic pruning, safety pruning, view pruning, restoration of neglected landscapes, landscape pruning to reduce risk of wildfire, and removals of trees under 24inches in diameter. The sense of civic wellbeing depends on the care given to the urban forest. Because trees are essential to the soul of the Bay Area, Brende & Lamb considers it an honor to care for your trees. Brende & Lamb has certified arborists that are passionate and knowledgeable about trees and pruning services. With over 25+ years of combined experience, Brende & Lamb stands apart from other tree pruning companies because of our high sense of aesthetic design. We are a highly specialized company and have refined our services so that we are able to provide some of the most beautiful tree pruning services in the Berkeley, California area. Blaine Brende, born and raised in Minnesota of Norwegian ancestry, has been living in the bay area since 1970. Blaine is a Vietnam era veteran, a sculptor, and a poet. He holds a BA and a MS from California State University, East Bay in Psychology. His masters thesis was on Horticultural Therapy. Blaine is a master pruner, and a great teacher. An unapologetic tree lover, Blaine has been a certified arborist since 1984, and a partner in Brende and Lamb since that time. Joe Lamb is a native of Santa Fe, New Mexico, and, like Blaine, a Vietnam era veteran. His writings about his experiences as a hospital corpsman have been anthologized in Veterans of War, Veterans of Peace, a book edited by Maxine Hong-Kingston. Joe holds degrees in Biology, Ecology, and film-making. Founder of the Borneo Project at Earth Island Institute, Joe spends much of his spare time working to further the human rights of indigenous peoples living in the rainforests of Borneo. Also an unapologetic tree lover, Joe believes that much of the solution to global warming will depend on how well we care for our trees, both in the industrialized world, and in the remaining rainforests. Because trees are not only beautiful, but are also essential to a sustainable future, he is very proud to be a tree care professional. Michael DeSerio, born and raised in Berkeley, honed his aesthetic abilities well before he came to Brende and Lamb. Mike holds a visual arts degree from University of California Santa Cruz where he focused on sculpture and photography. Also an accomplished chef, Mike cooked at Chez Panise for 5 years. His love for good food led him into growing vegetables, and gardening morphed into a passion for landscapes and trees. Michael applies his training as a visual artist by identifying the sculptural framework of the tree so as to better reveal its best form. He relates pruning trees to four-dimensional sculptures, with the forth dimension being the future growth and expansion of the tree. As a certified arborist, Michael uses his knowledge of the aboriculture to help clients shape their landscapes to best fulfill their specific needs and desires. Call 510-486-8733 or click to contact Brende & Lamb online.